What’s the big deal? I’m just out on my veranda. 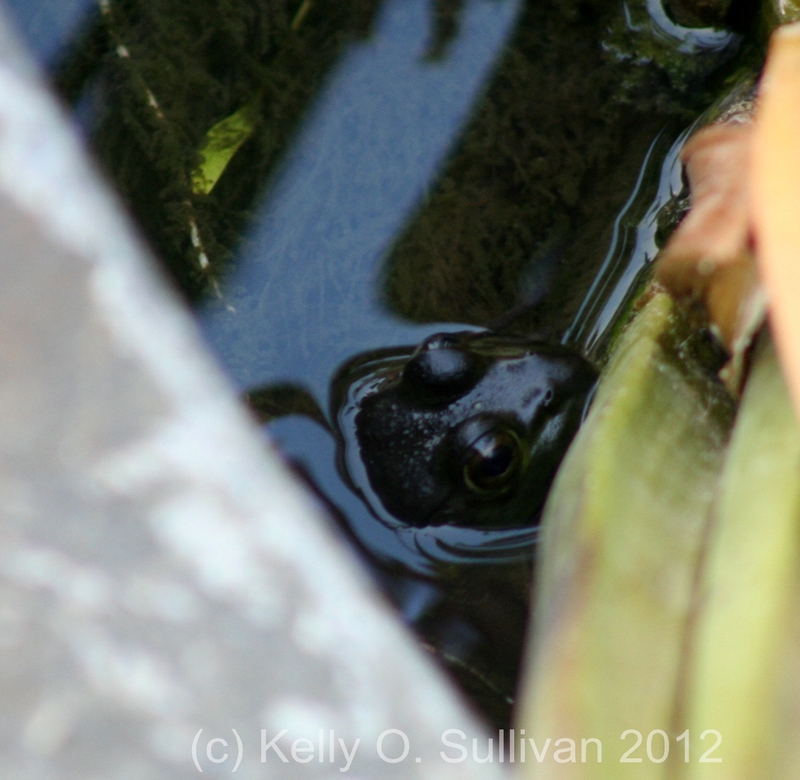 I went outside and looked for Eyeballs and Cave Frog among the plant pots and the lily pads, but spotted no one. 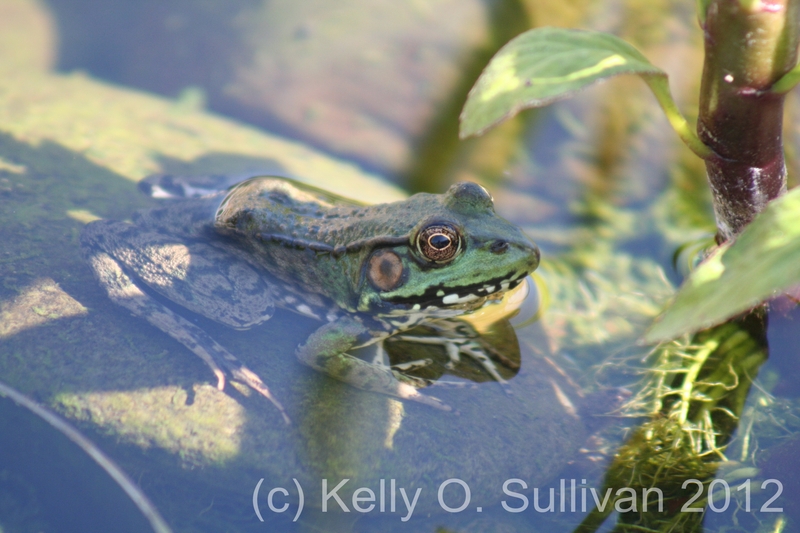 I decided to take the walk around the pond to sneak up on the back of where Uptown Frog hangs out – just as I was getting near, I realized he was WAY out in the open on a rock a bit upstream from his little condo area. 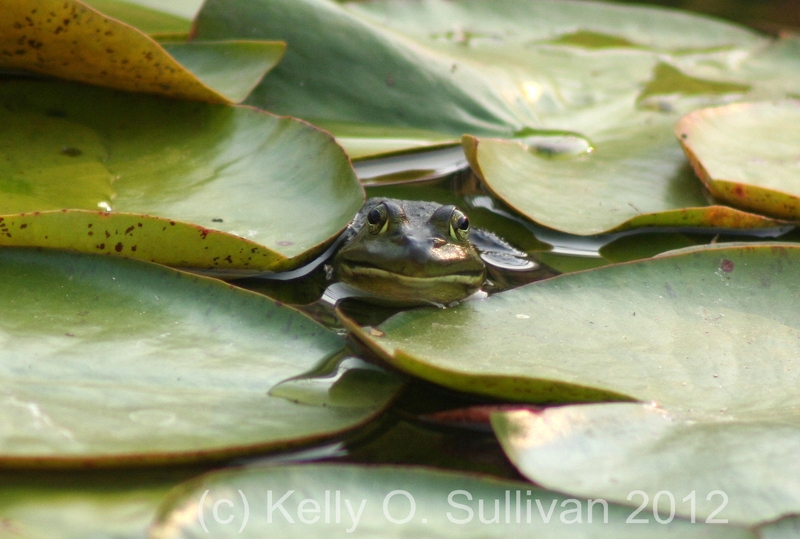 I slowly walked all the way back around the pond and got the camera. I don’t think I took a breath the whole time I was edging the tripod into slightly new positions to try and get a good view of him without the plant stalks blocking everything. Happily, he stayed there the whole time! This may be the best view we ever get of him – and it’s a good one! I have found a more sturdy float. Excellent. 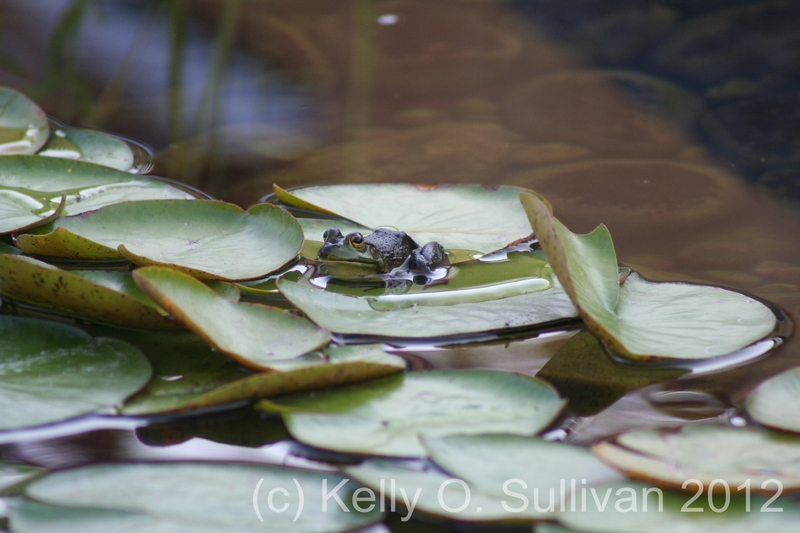 While Cave Frog still makes it sink and flood a bit, on this day the lily pad he chose to sit on had stronger support so he’s a bit higher up. I have no idea if that helps his hunting, but he looked more stable. Can’t a frog get a little rest without a camera being brought out? Although the legs are underneath of this frog, I’m fairly certain this is Eyeballs – only because Cave Frog rarely hangs out by these plants. I really like the reflection of the iris leaves over the back of let’s-assume-it’s-Eyeballs. I had almost decided that Uptown had moved out – but I crept up from behind the boulder where he hides and spotted his snout! So I quietly got the camera, never thinking he would actually stay still while I got in position. The angle was awkward and this was the only one from which I could see him – all others were blocked by the plant. Guess this guy’s the introvert of the frogs. Hard to believe how long ago we finally admitted Brave Frog had moved on. It’s a good thing I took a lot of photos of him while I had the chance! I can’t look at this without giggling. 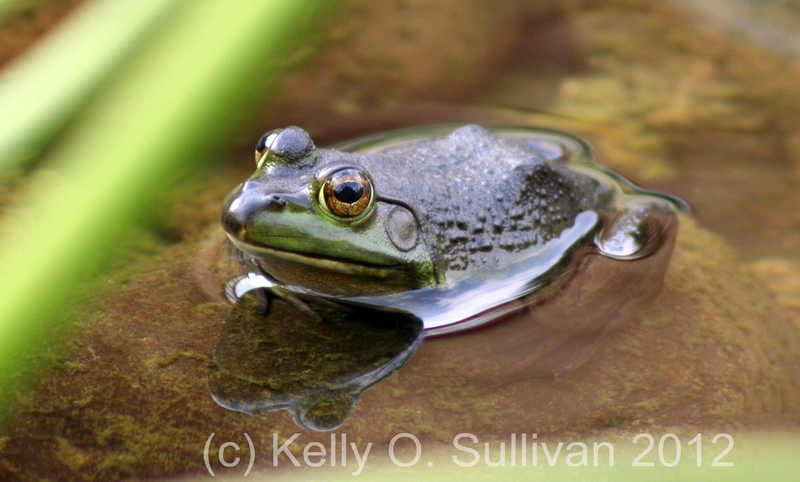 Cave Frog (sitting on a slightly submerged lily pad) reminds me so much of those frogs on the commercials for Budweiser. Terrible beer, but funny commercials. 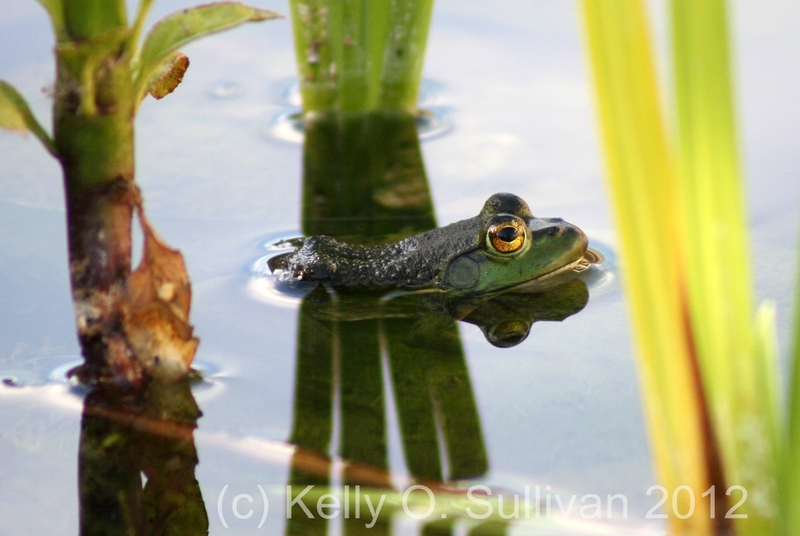 I don’t need a lily pad to float – I’m a masterful floater. I can always tell it’s Eyeballs when he is floating and has his legs out behind him. Cave Frog prefers to have his legs underneath him – presumably ready to hop. Eyeballs has a different approach.